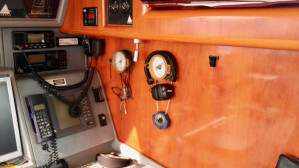 Fully equipped for safe, long distance sea voyages and live-aboard. 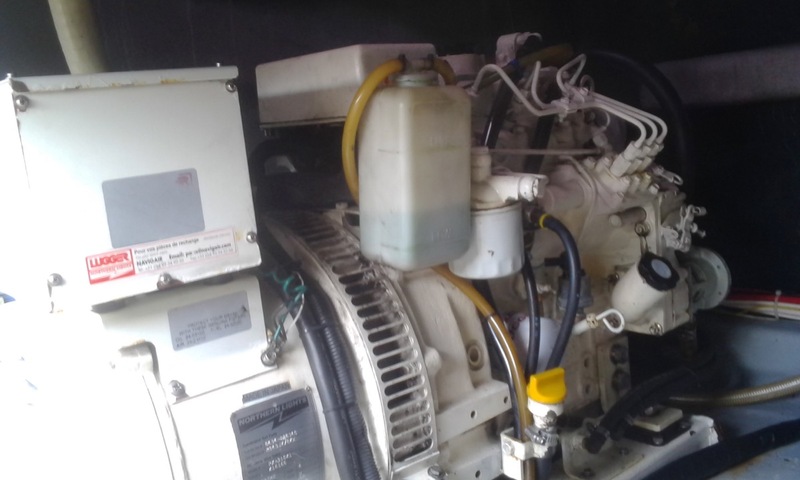 Highlights includes: Twin Volvo 78 HP engines with direct shaft drive for optimal reliability in remote places. Sail wardrobe includes mainsail, gennaker, code 0, solent and two spinnakers. 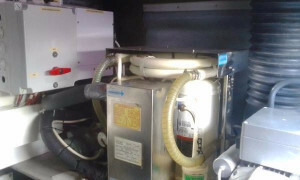 Large 8 KVA Northern Lights generator, air conditioning, 2x watermakers, 500W solar, 2 x wind generators, washing machine, electric Vacuflush toilets. 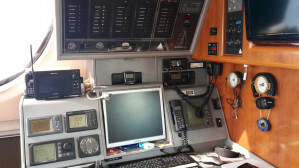 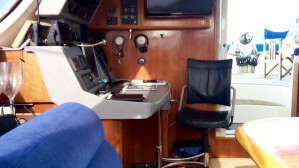 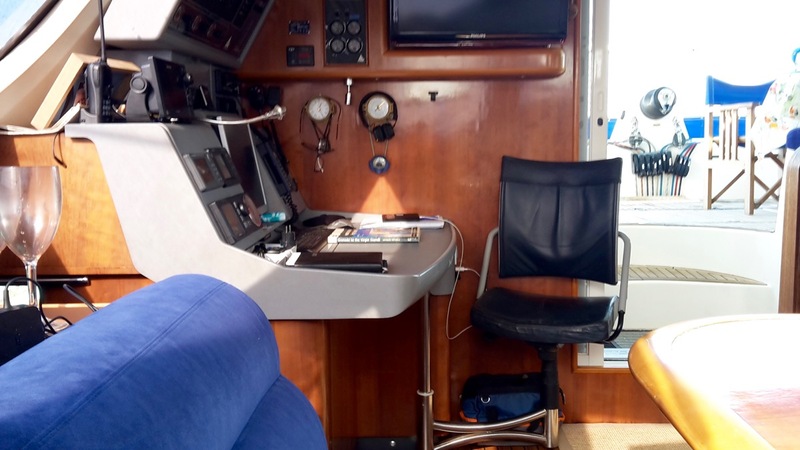 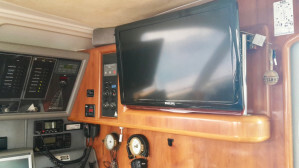 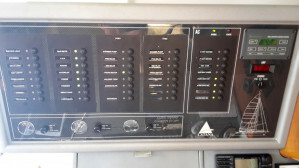 The navigation electronics are B&G, Furuno plotter and radar and Simrad autopilot with repeaters at each station, navigation area and owner’s cabin. 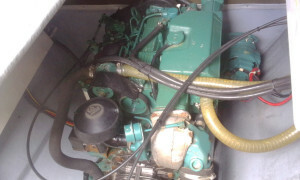 There are three hydraulic winches, a dive compressor, large 4.5m RIB dinghy and 20HP Honda outboard. 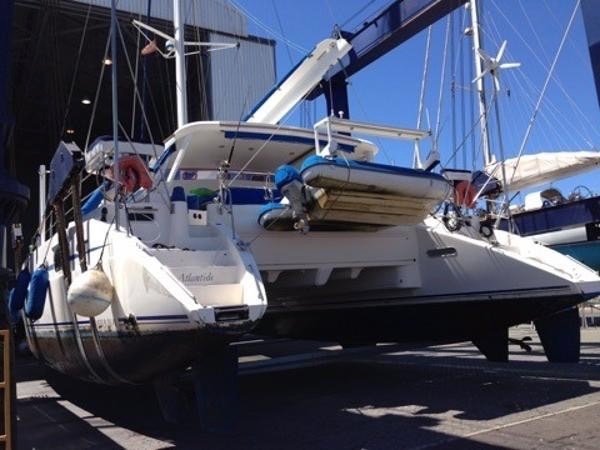 This remarkably well maintained example of the 'Caligo 522' is a rare find. Her owner, who owns a shipyard, has lavished the very best of skills and expense on his dream boat since the very beginning. The boat was never chartered and kept for the owner's private use only. 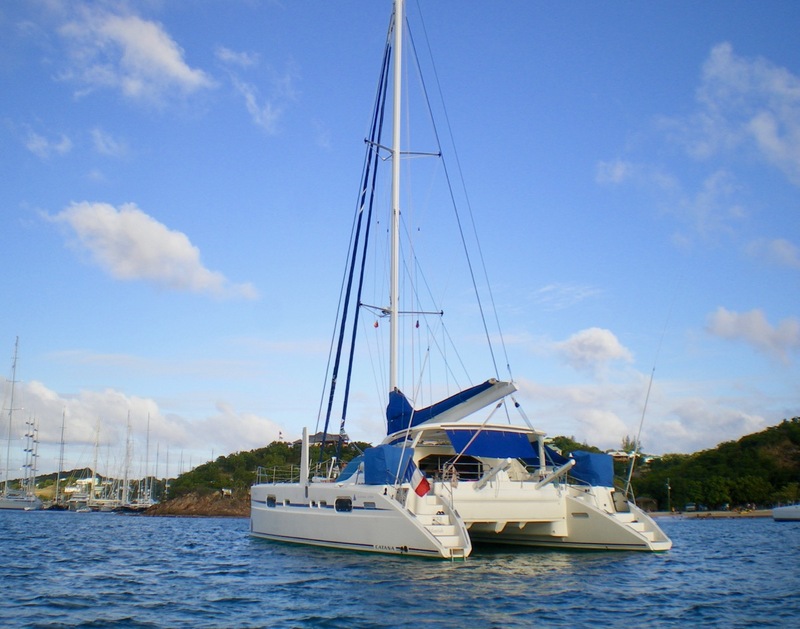 Renowned for their reputation as strong, fast catamaran designers and builders, the Catana's reputation needs no introduction. From the top of the mast to the bottom of the keel, durability, quality and comfort is visible in every detail. 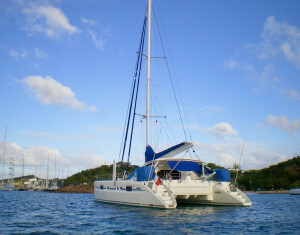 Built for eating sea-miles at any latitudes and remain at sea for long periods of time, the Catana 522 is first and foremost built to sustain the assaults of the sea, with an incredibly stiff and strong hull, over-engineered crossbeams and bulkheads, as well as at the ideal height to width ratio, making this catamaran agile on the water, easy in the seaway, and first and foremost stable no matter the weather conditions. 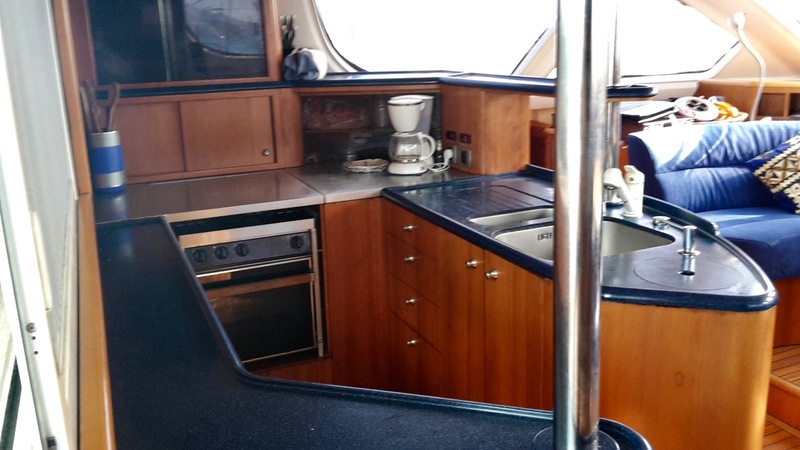 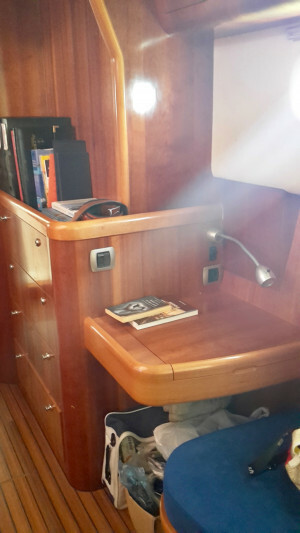 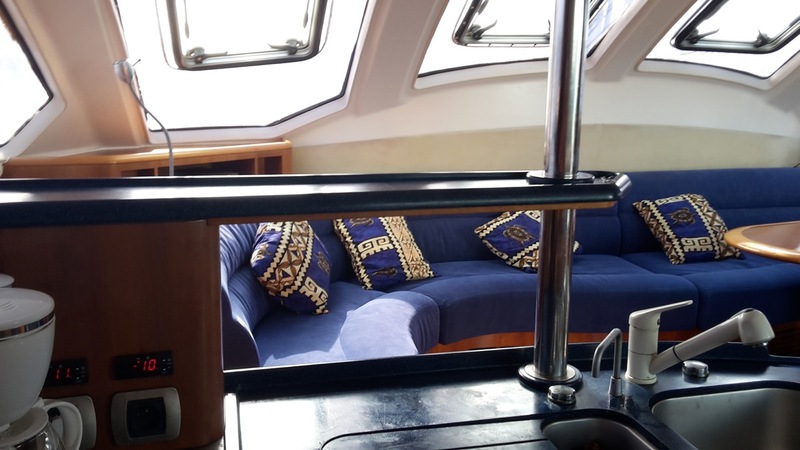 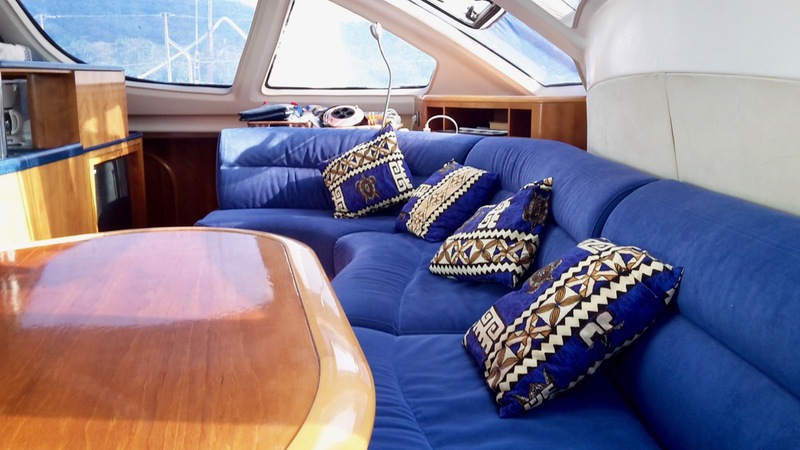 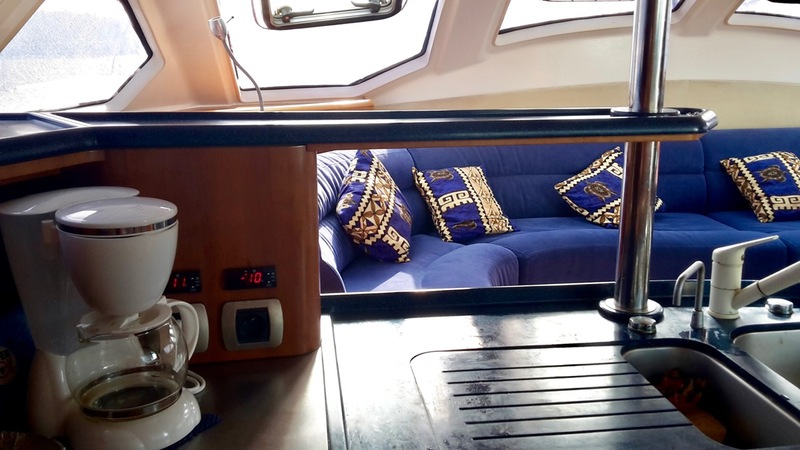 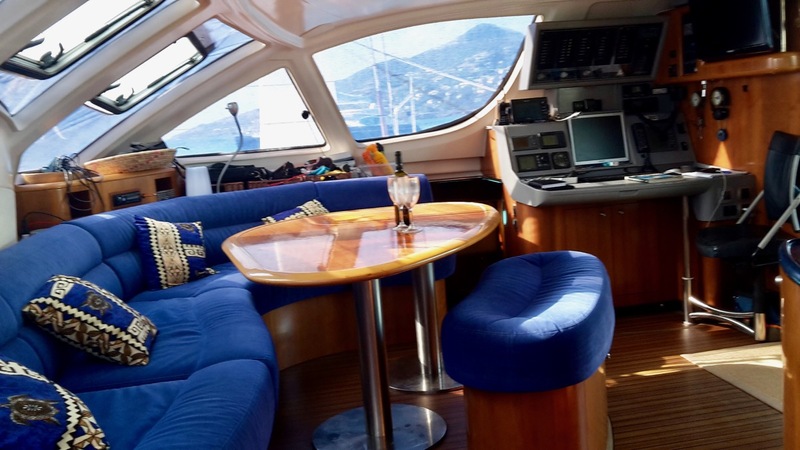 It is for these reasons that her owner, an experienced seaman and avid ocean voyager chose her as his as soon as Catana Yachts introduced him to the drawings of the Caligo 522. 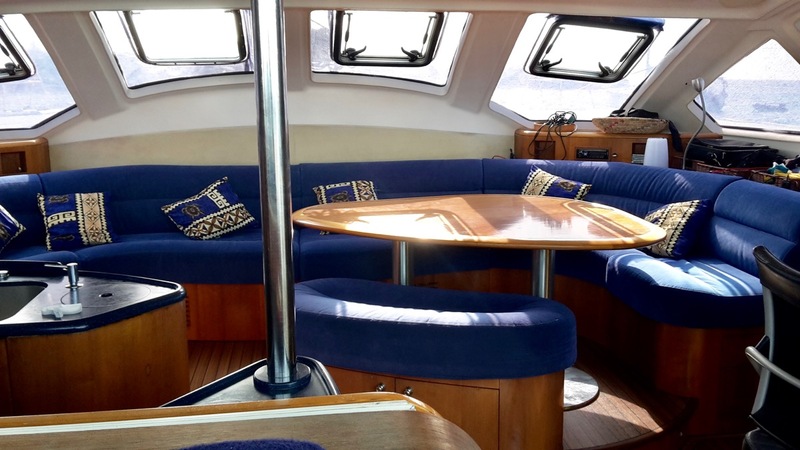 With long, non-stop passages in mind, the owner then proceeded to equip the boat with a priority on independence and reliability. 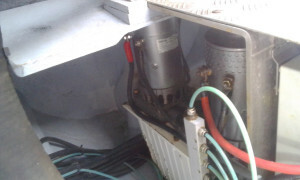 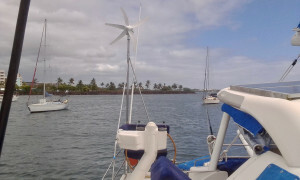 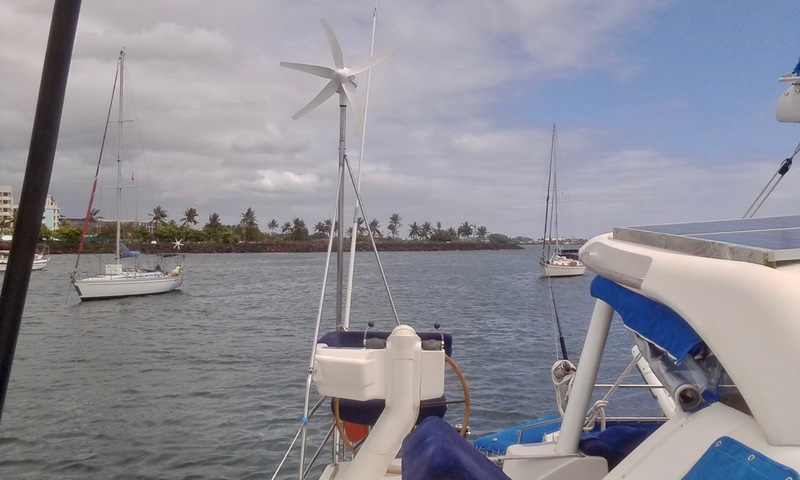 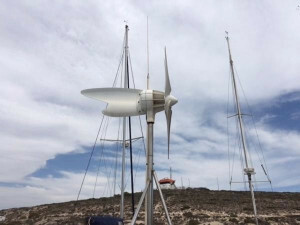 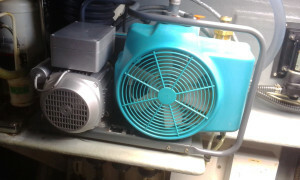 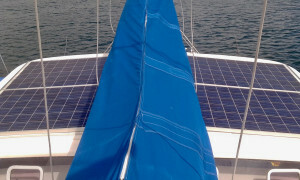 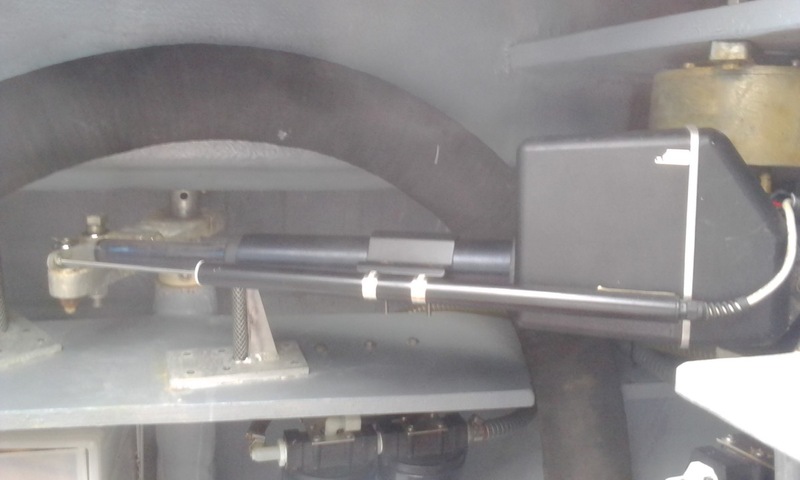 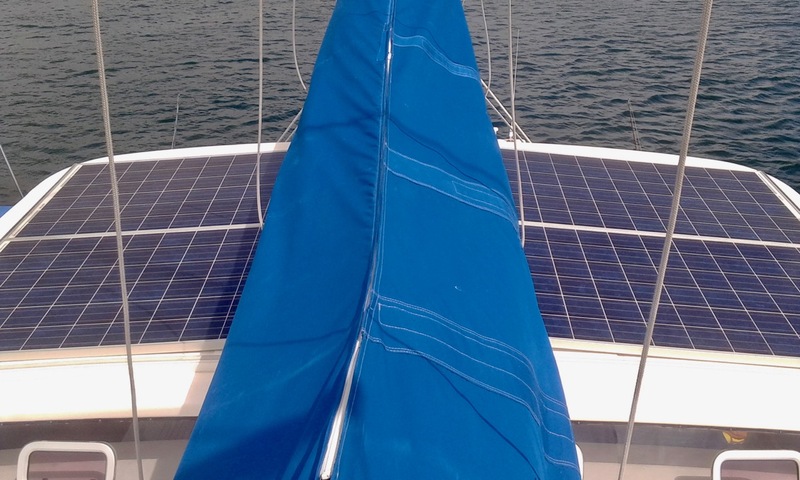 For unlimited power, the boat is equipped with two wind generators, 2X 500W solar panels and a 8kva Diesel generator. 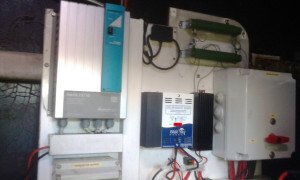 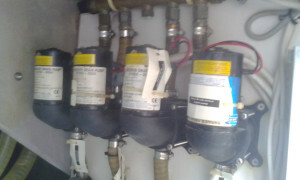 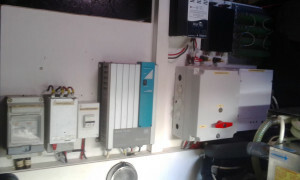 For unlimited water, two powerful water-makers, one 180l / hour (220V) and a 60L / h (24V) have been installed. 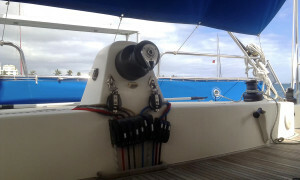 For ease of handling, 4 X hydraulic winches are fitted within easy reach to the skipper. 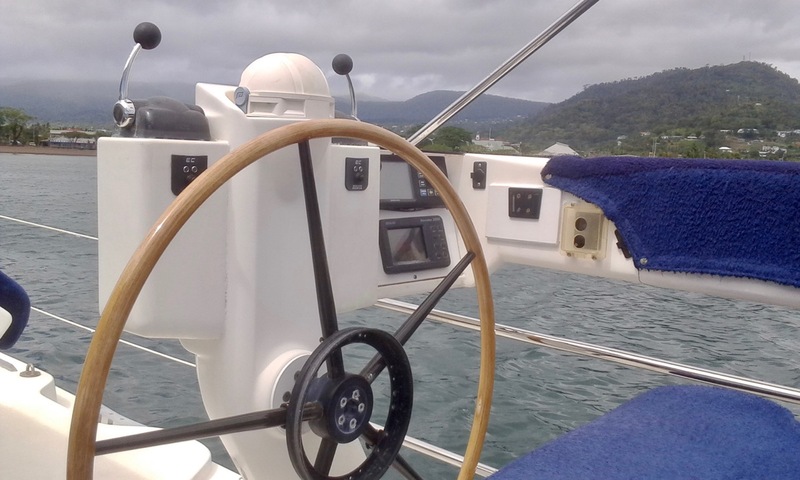 Top of the range B&G instruments, Radar, AIS, two plotters, repeaters at helms, navigation area and owner's cabin, will give you peace of mind when cruising: everything is doubled and set-up to offer an alternative, safe arrangement should one system fail. 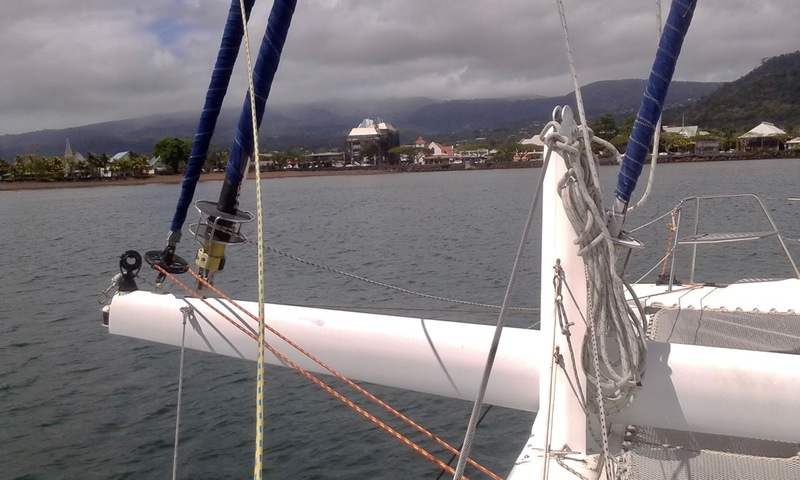 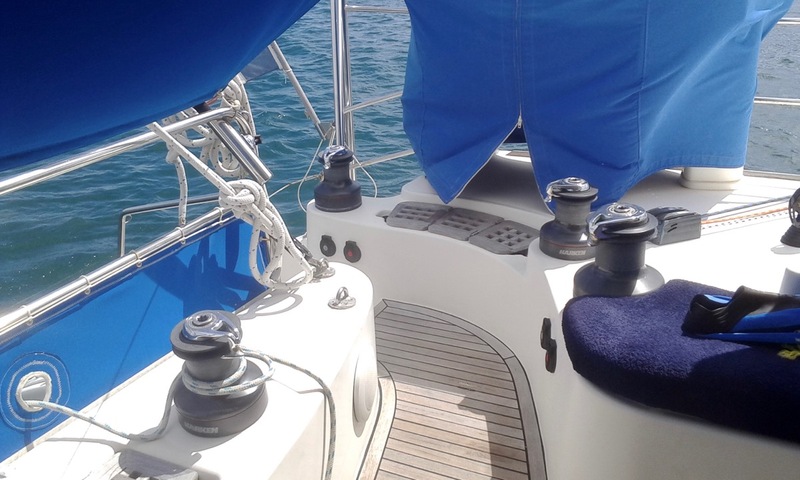 Perfect for making optimum, safe use of the trade-winds, three headsails are fitted to the bow with the help of a sturdy bowsprit signature of the Catana 522 ‘Caligo’. 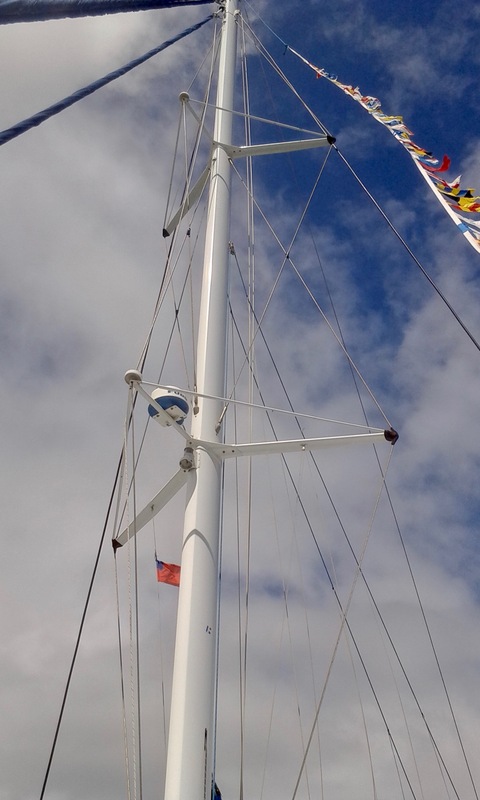 These are all on Furlers for easy deployment, and include a Gennaker, Genoa and a staysail, which is self-tacking. 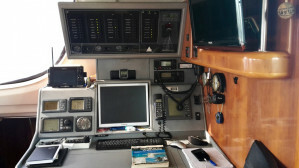 All the lines are ran to the cockpit for safe handling and fed through individual jammers and power / hydraulic winches. 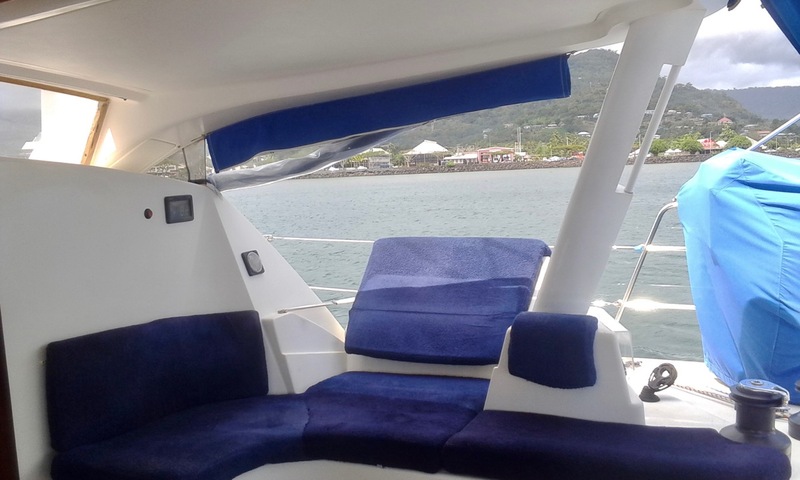 In short, this powerful catamaran can be easily handled short-handed or by just one person and is equipped with this priority in mind: safe, fast, efficient, easy to handle. 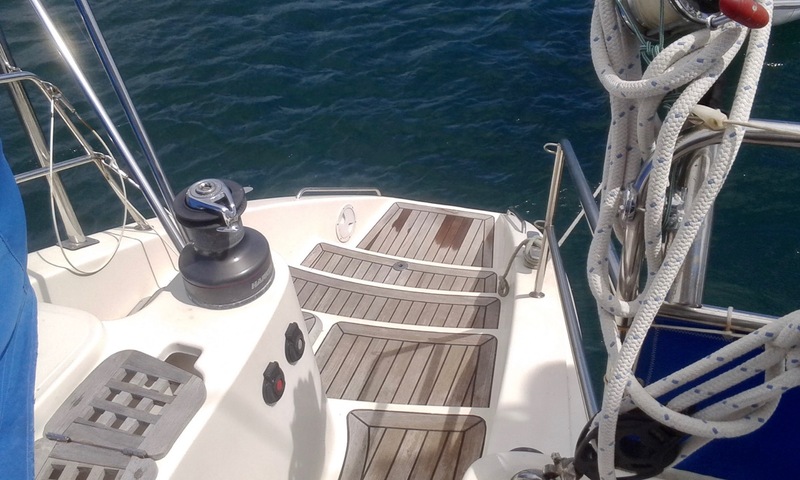 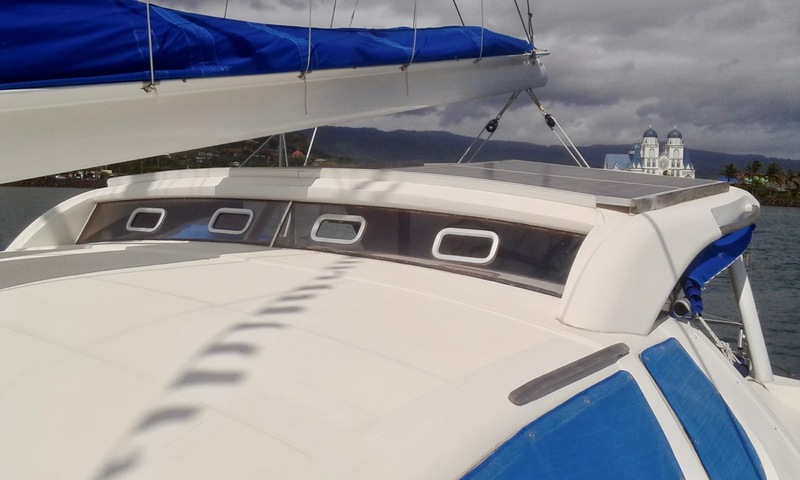 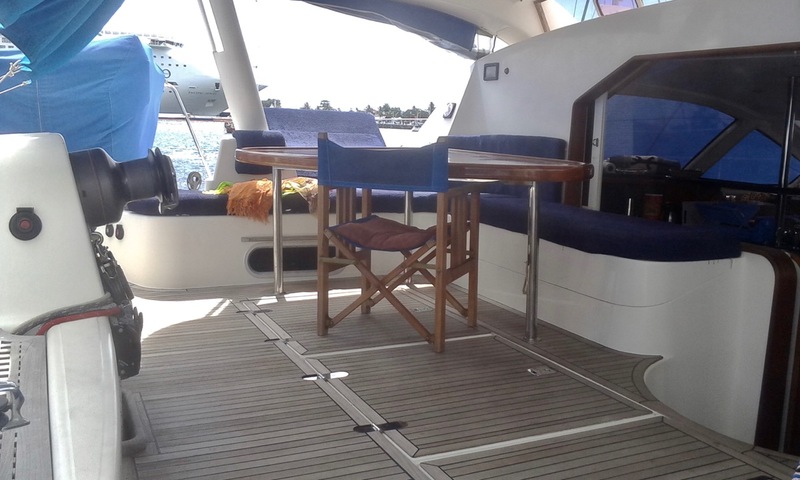 Unlike other cruising catamarans, the Catana has two very easy to use daggerboards, which increase her speed and upwind capability as well as handily retract for accessing very shallow water areas. 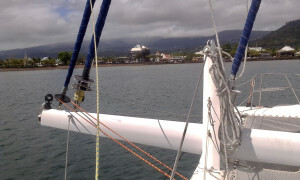 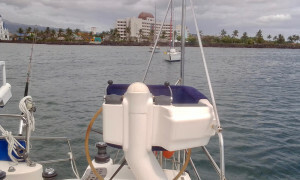 The rig and sails were fully replaced in 2010, with the mast taken down for full inspection and replacement of all fittings. 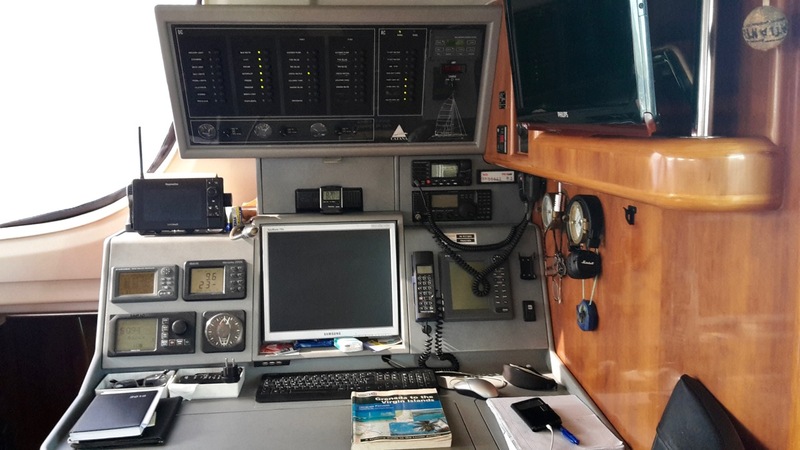 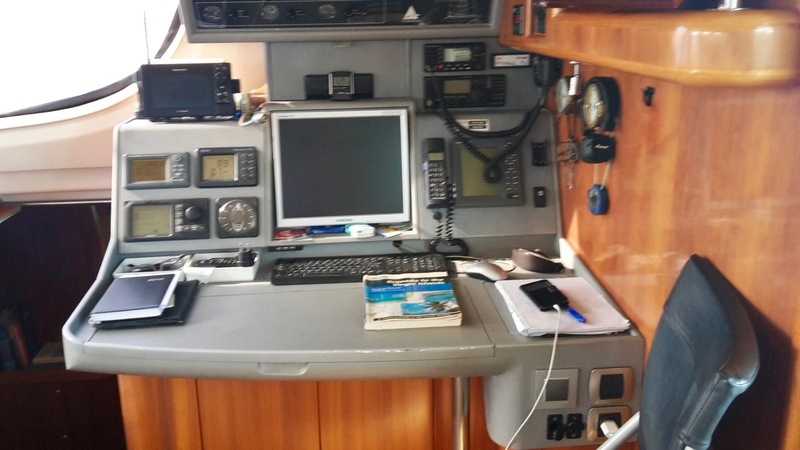 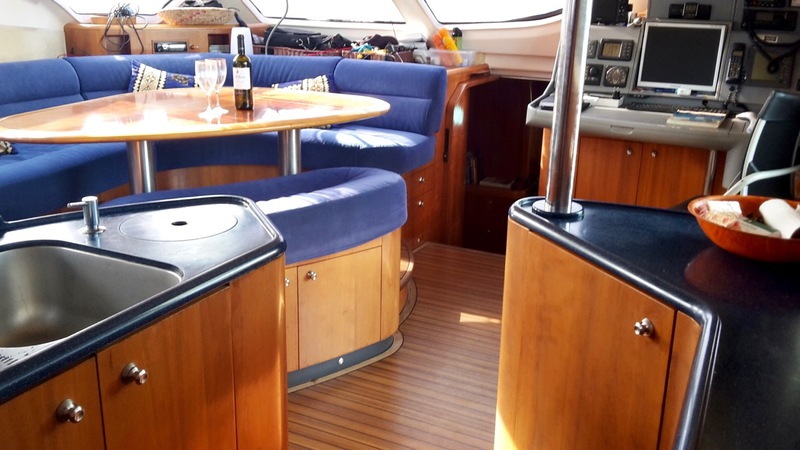 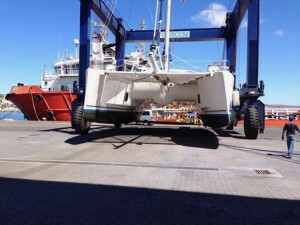 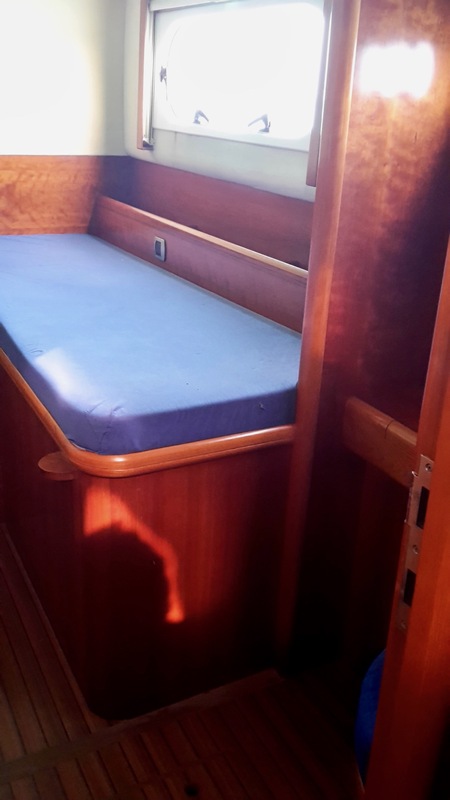 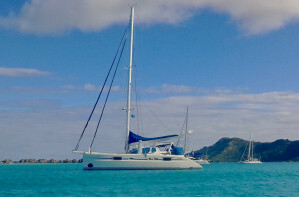 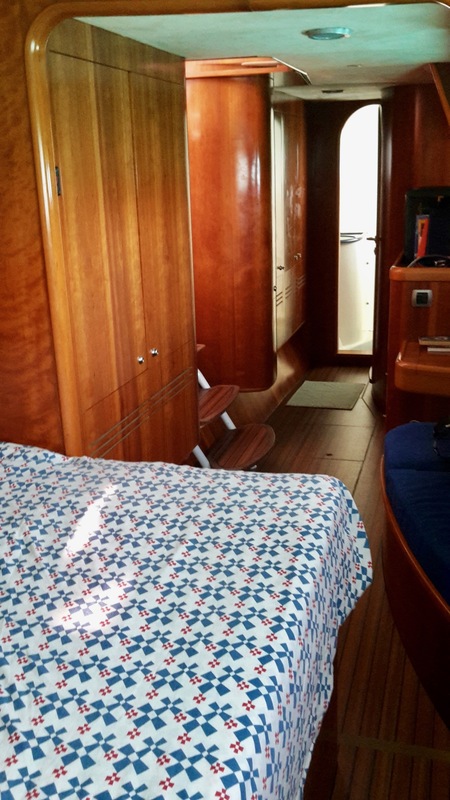 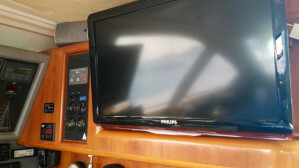 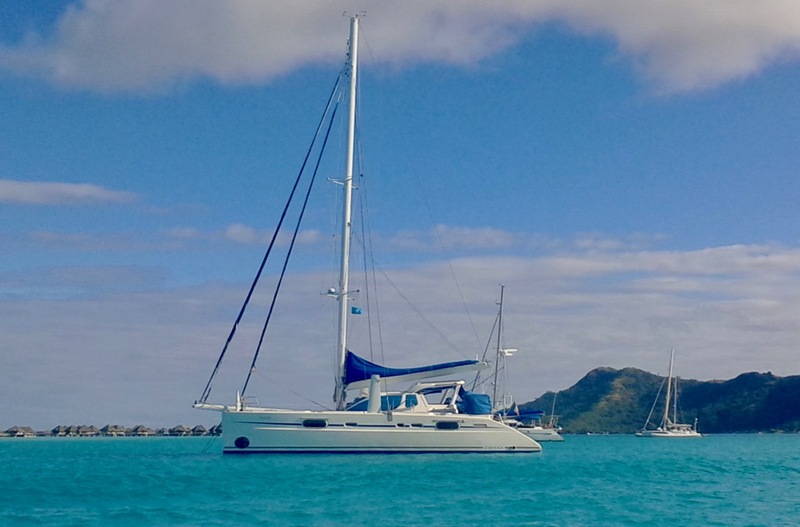 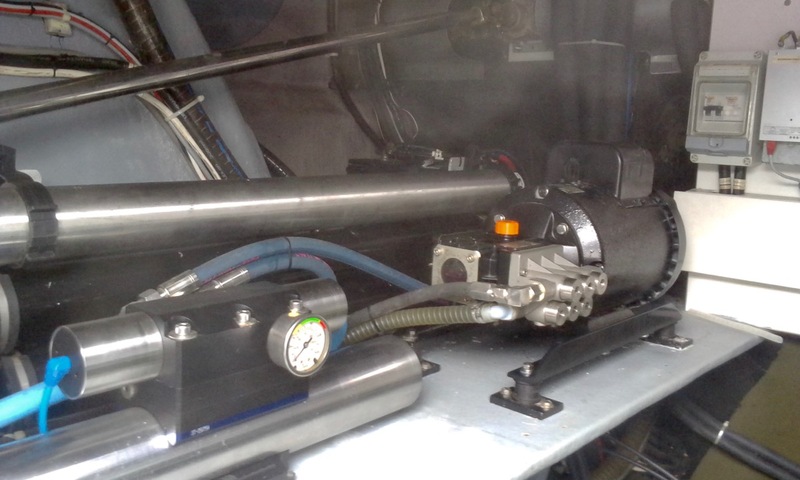 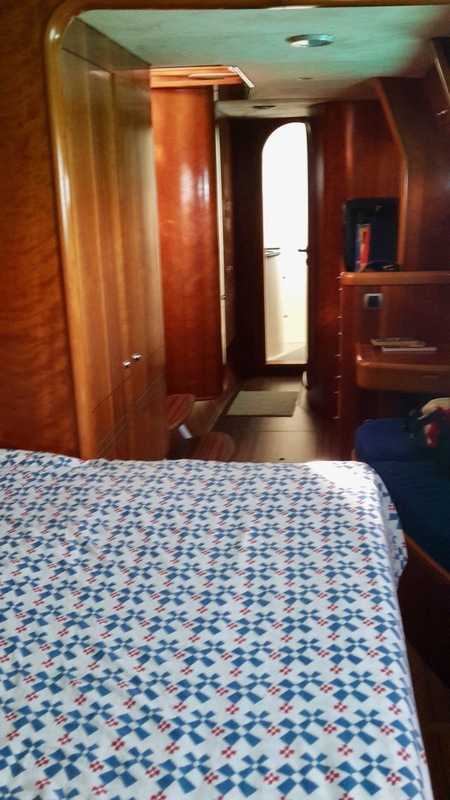 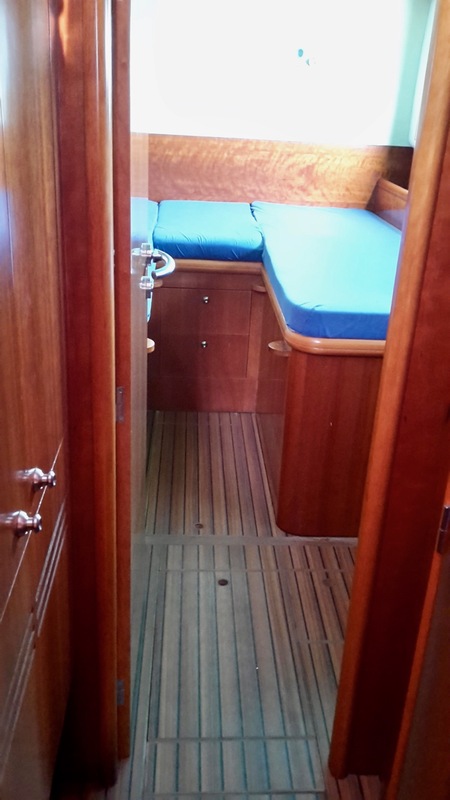 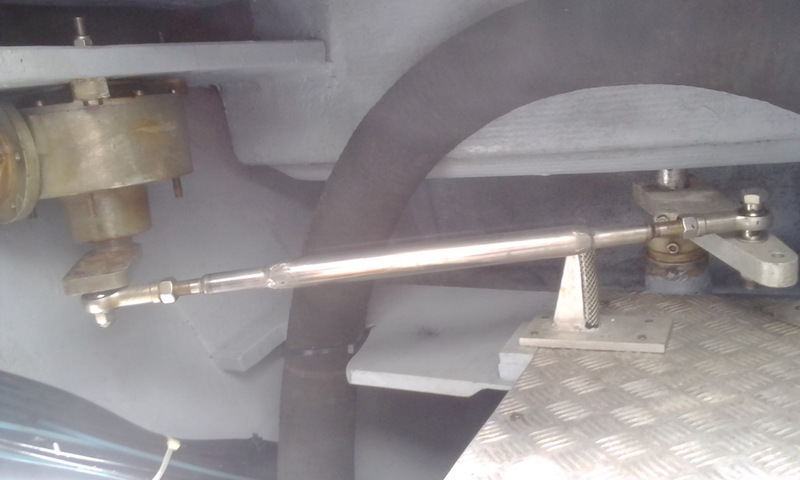 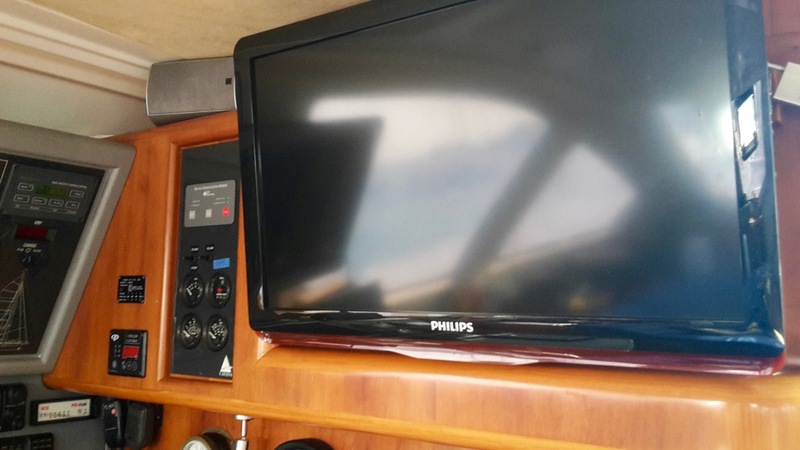 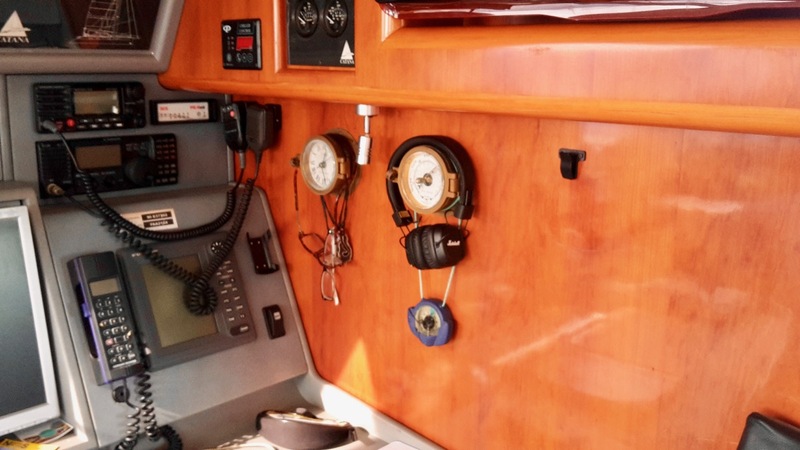 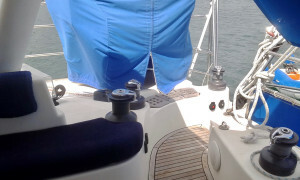 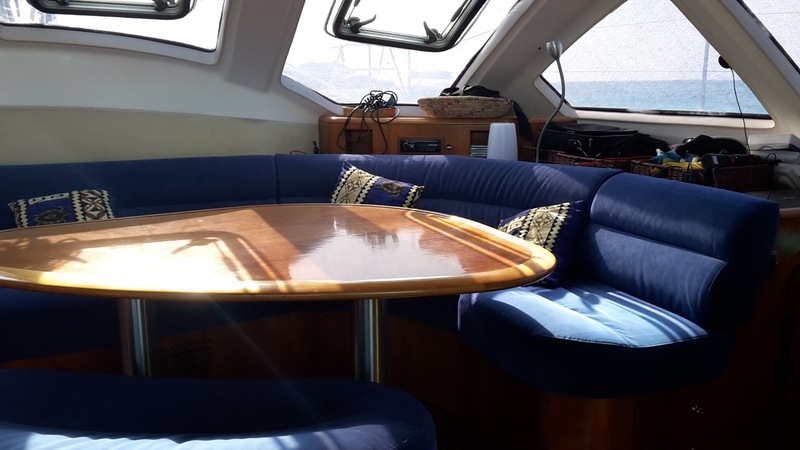 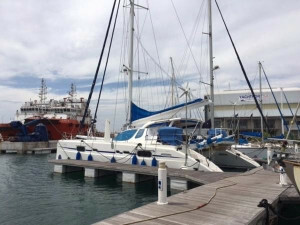 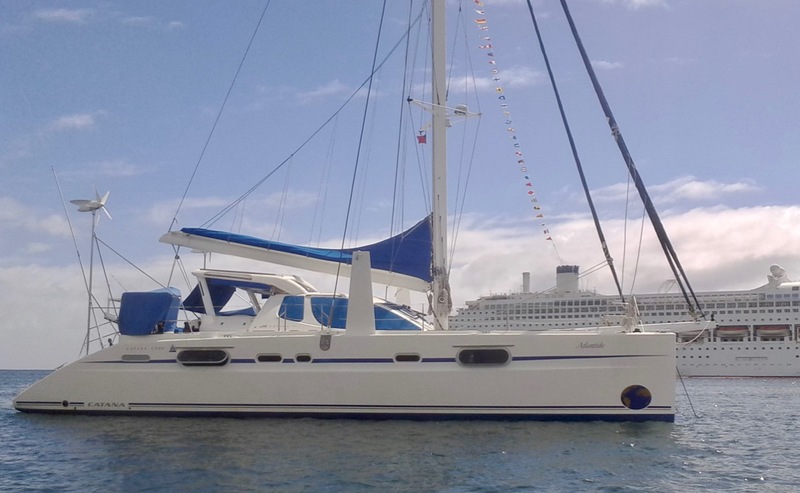 The owner was preparing to take the boat from Europe to the Caribbean and wanted to ensure that everything was checked and replaced, and opted for a full re-rig before leaving Europe. Moving to topic of creature comfort, this magnificent boat is hard to beat. 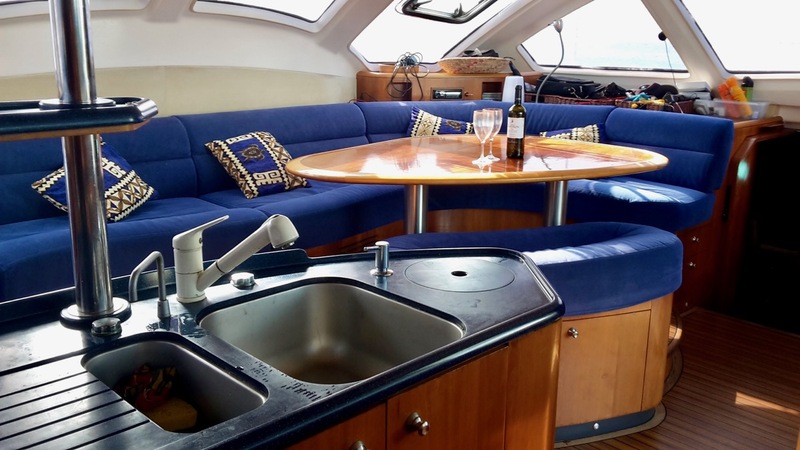 Equipped with air conditioning with separate controls in each areas, impeccably presented and maintained woodwork, upholstery and Alcantara headlining, one finds it hard to credit this boat with so many ocean passages. 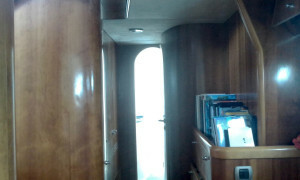 The interior, as is the general condition is impressive. 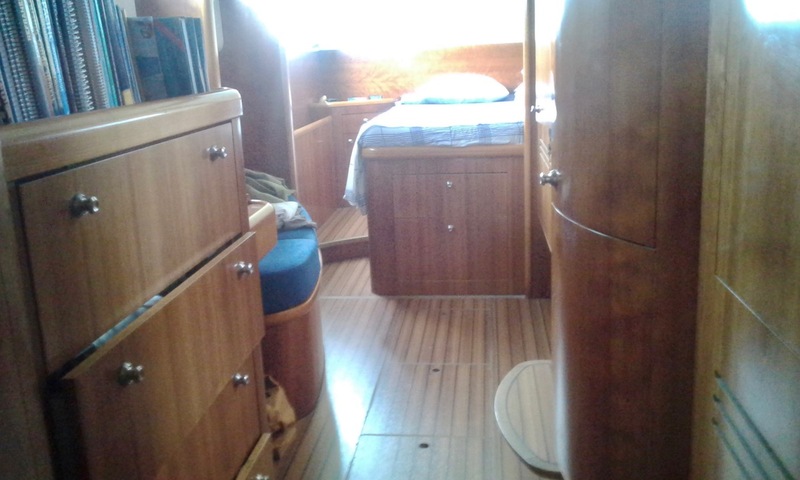 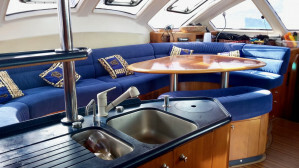 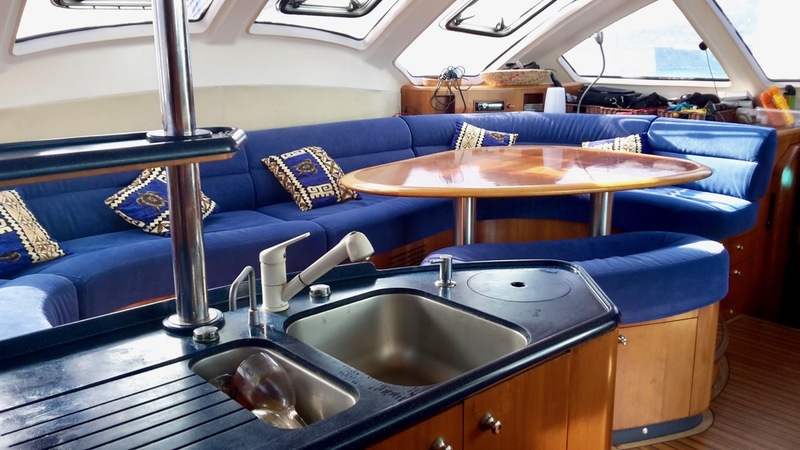 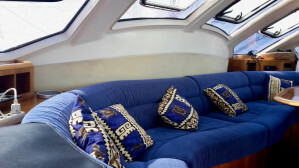 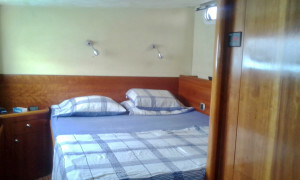 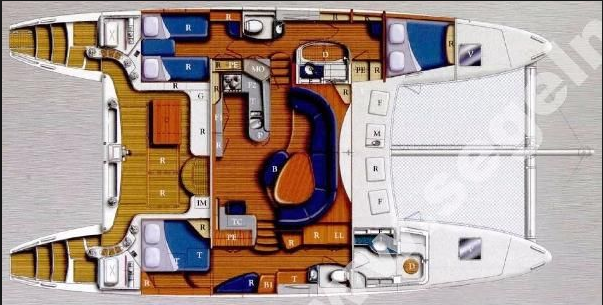 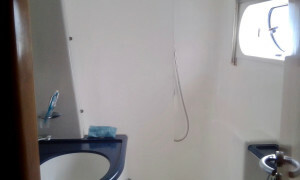 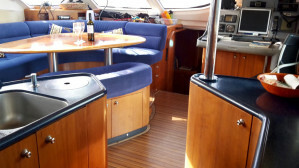 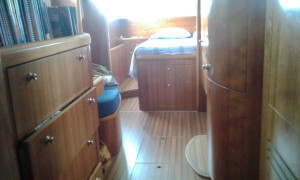 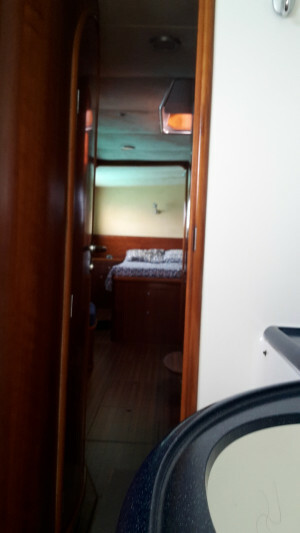 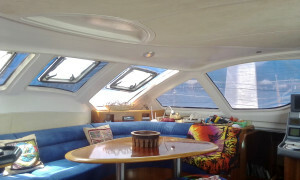 The layout is the owner’s version, with one whole hull is reserved for the owner's private use. the size of a veritable apartment, the aft section is occupied with a huge queen size bed, followed by a desk area, walkthrough wardrobe and huge ensuite with separate toilet to one side and a huge bathroom with walk-in shower forward. 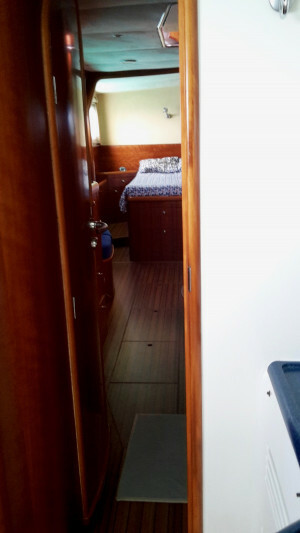 Once again, as the boat is designed for extended live-aboard, the storage capacity is remarkable throughout. 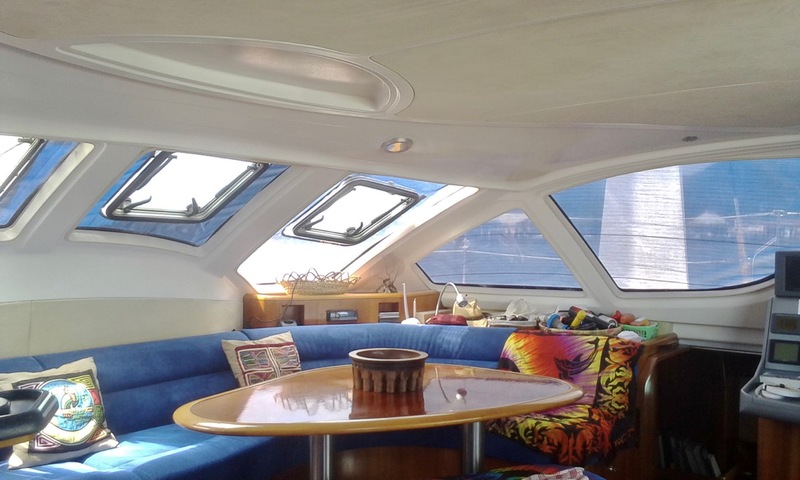 Several well-placed opening overhead hatch and portholes provide abundant air-flow as well as light. 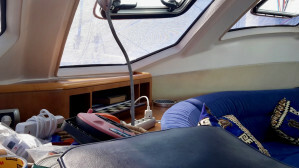 All hatches are equipped with sliding blind or curtain. The guests side of the boat is occupied with a large double cabin aft with twin berths that can be converted to a huge double. 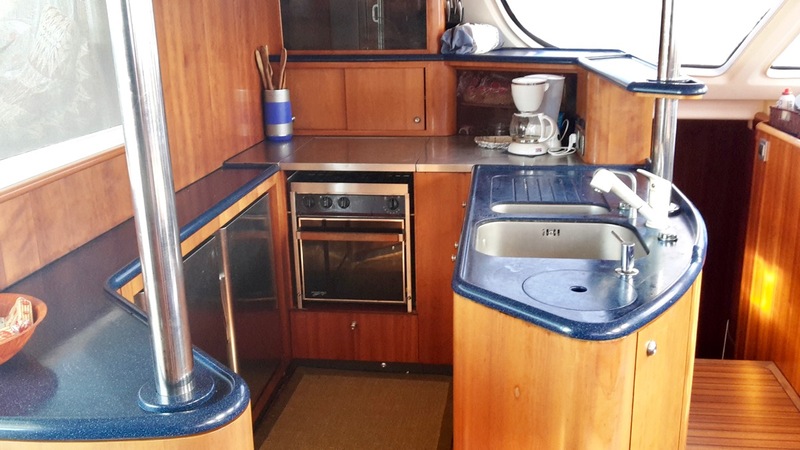 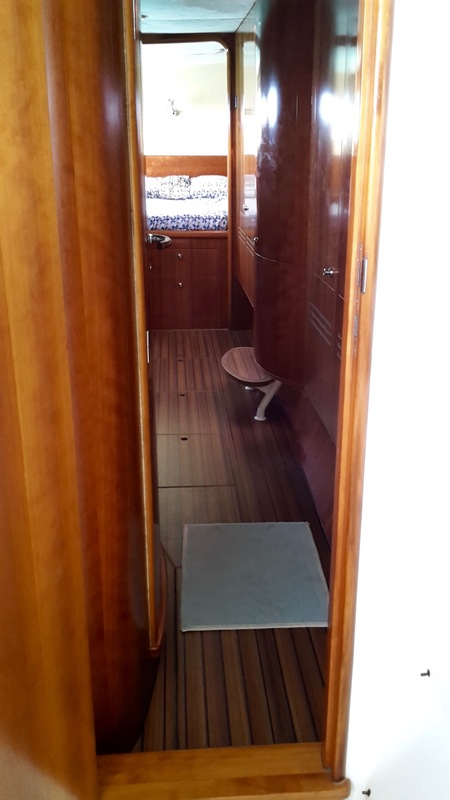 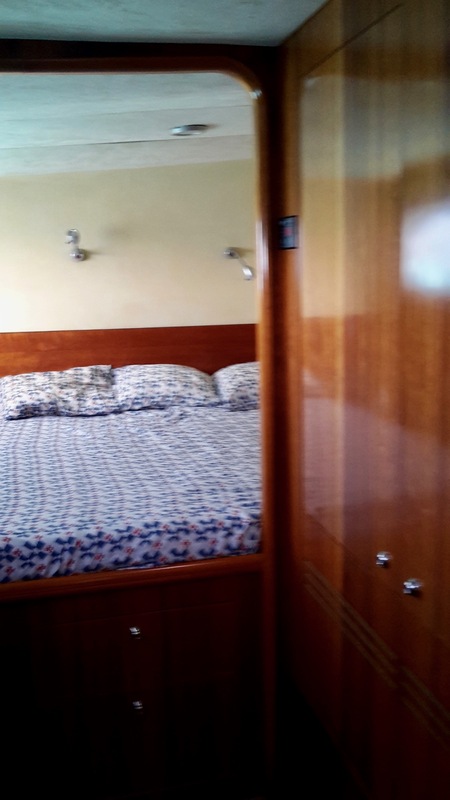 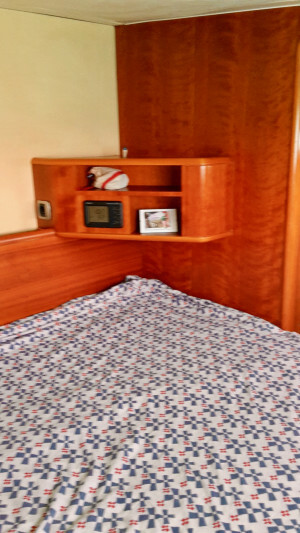 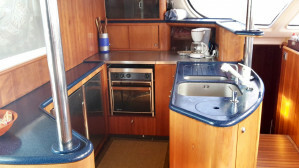 Walking forward, there is a separate bathroom with walk-in shower to the right and toilet at midships on the other side, with the third cabin forward, which is furnished with a queen size berth. Again, a large amount of storage, light and cross ventilation from the many side and overhead opening hatches ensure that guests and family can travel in comfort. Moving up to the giant saloon: the whole space is used to maximise the sensation of space and flow between the interior and exterior. the view from the windows and sliding doors to the cockpit is un-matched, yet provides protection from direct sunlight with the help of fitted UV-prottectove shades. 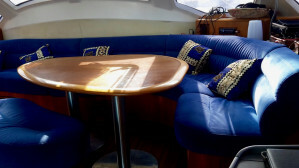 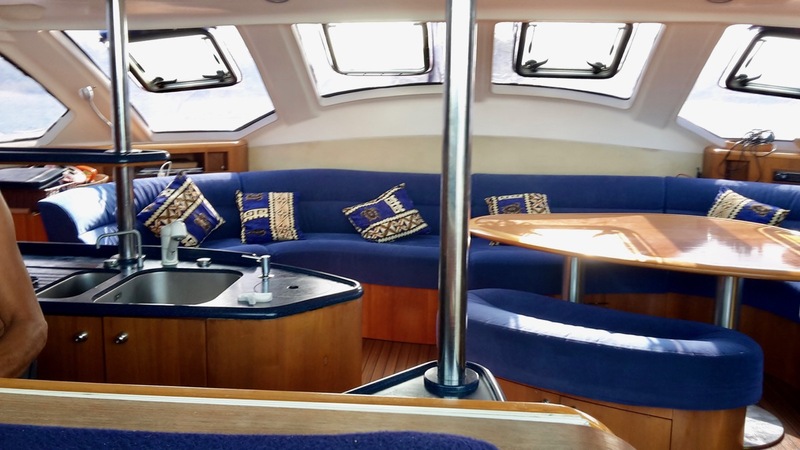 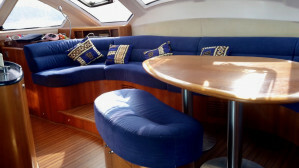 Large saloon / sitting area is big enough for 10 people comfortably, and is upholstered in blue Alcantara in perfect condition. 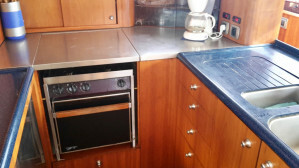 The U-shape galley is equiped with large front opening freezers and separate huge fridge. 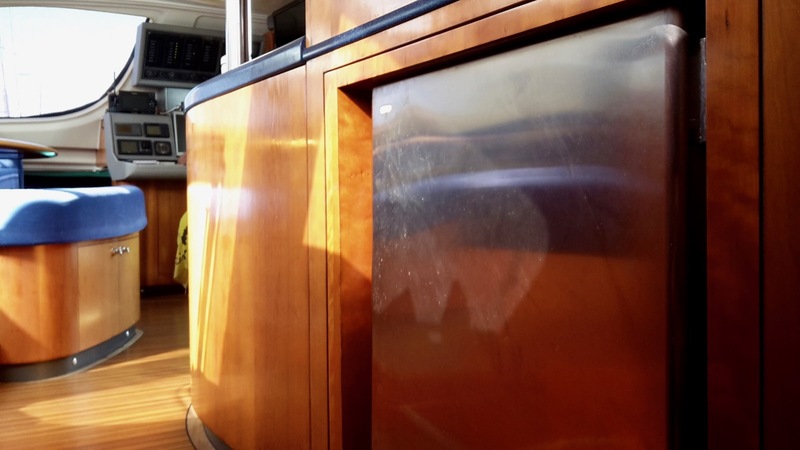 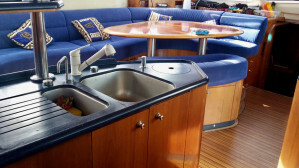 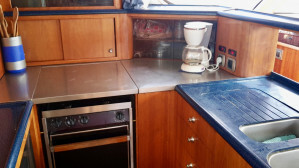 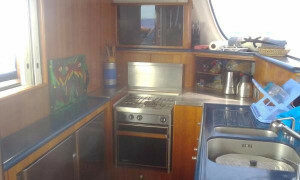 The galley is fully equipped for gourmet dining and suitable for commercial use if needed. 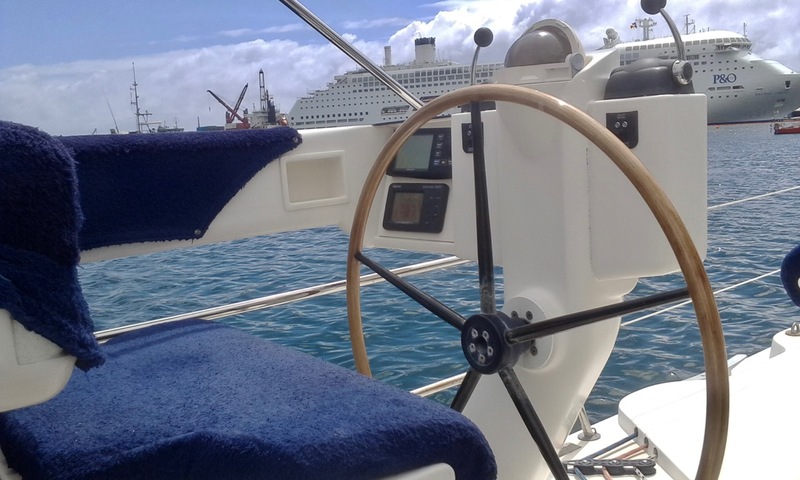 Back to the cockpit, the two helms provide second-to-none view in all directions and will make docking on any side easy and safe. 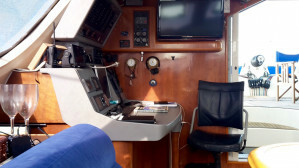 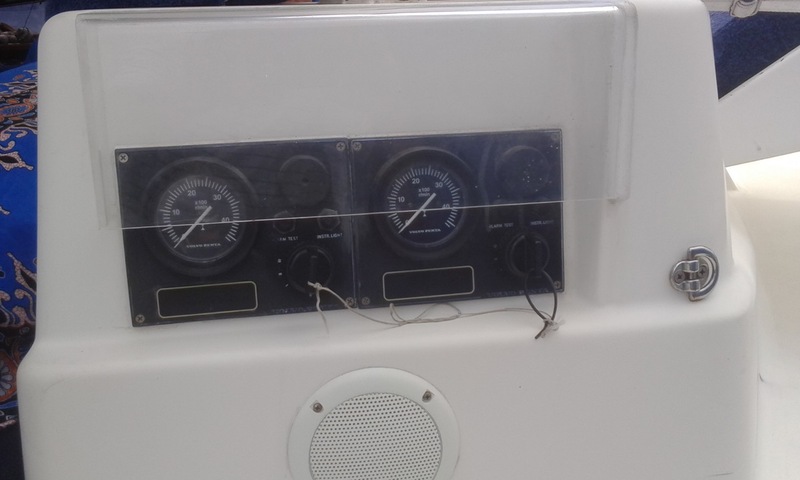 The instruments and repeaters are doubled at each helm, as well as fitted with electric throttles and a very comfortable, safe helm-seat within easy reach of the power winches controls. 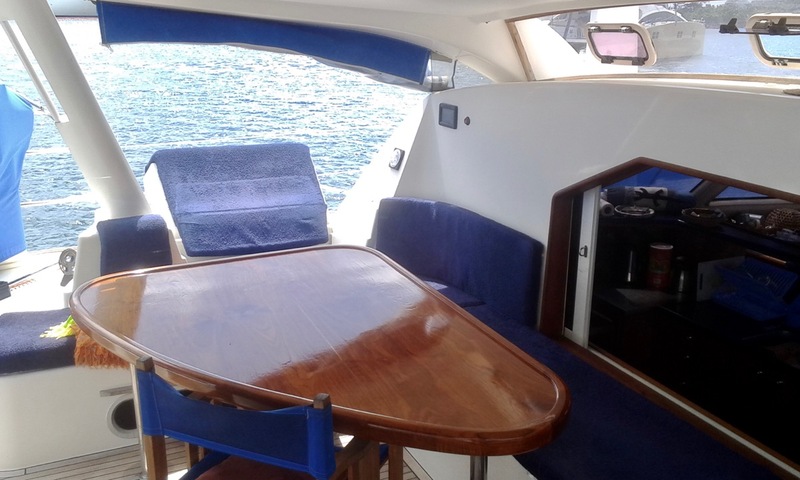 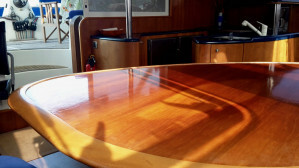 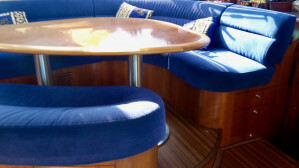 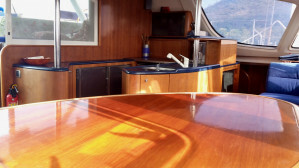 To port is the the dining area with its beautifully crafted teak table and ample sitting area. 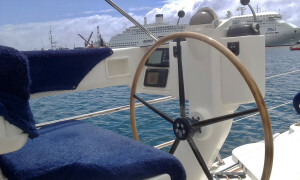 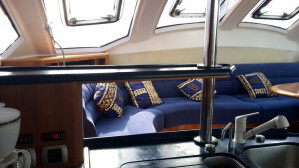 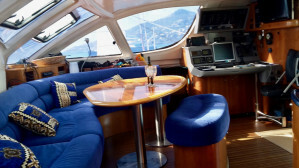 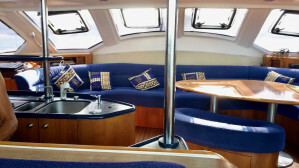 the whole cockpit is designed in a way to allow guests to relax safely when at sea while allowing the skipper to reach all controls without being impeded. There are numerous storage hatches and compartments in which to stow all your equipment and water toys. 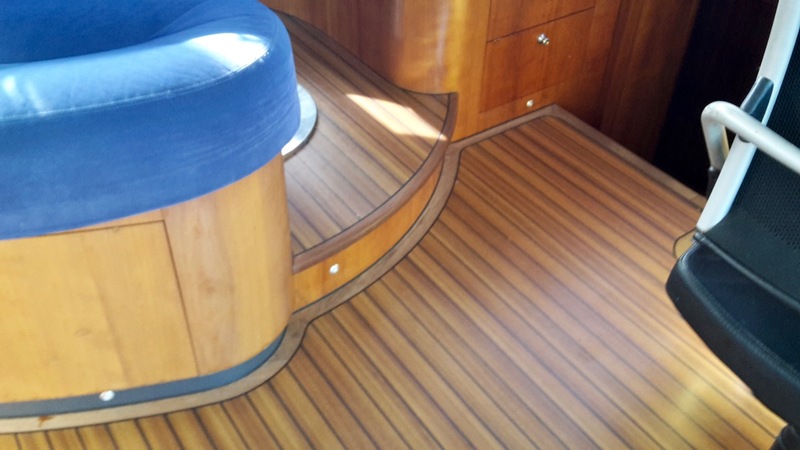 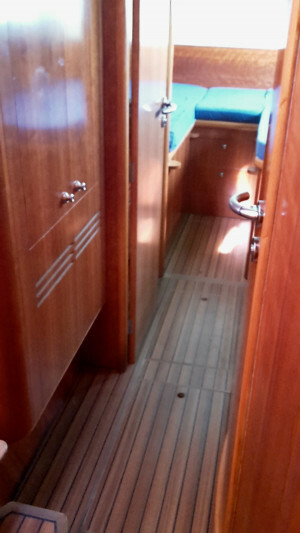 The teak flooring, which extends to the wide and easily negotiated transom steps is in excellent condition. 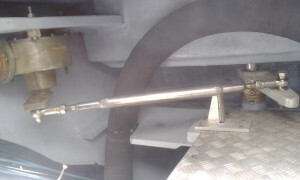 Access to the engine is provided by two large access hatches. 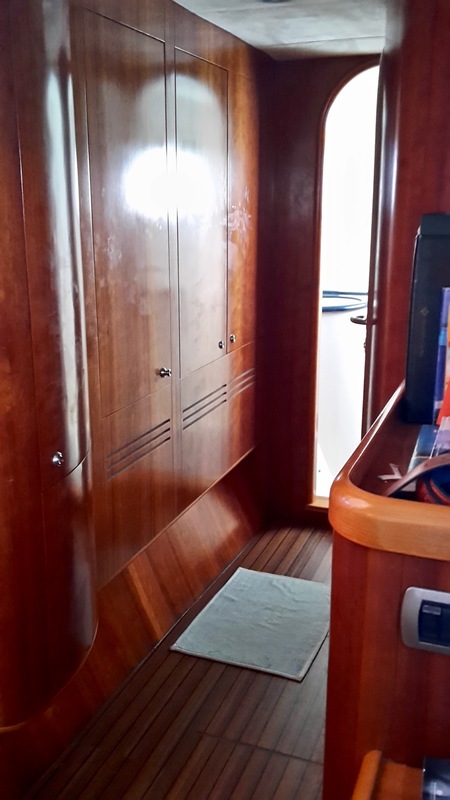 Needless to say the engine rooms are immaculate, and large enough to easily provide an excellent, religiously organised space for the generator, water makers, more busy systems etc. 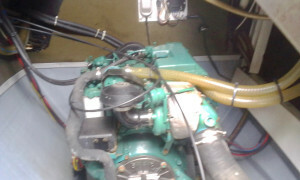 Everything is easily accessed for maintenance. Please contact Anna for more information and to organise for an inspection. 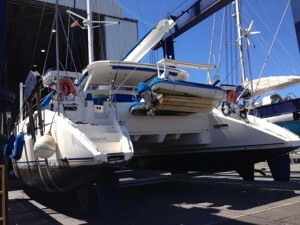 This yacht has just arrived in Italy, and can be inspected 7 days a week with a little notice. Draft: 1.10 / 2.50 m, 4'5"
Complete safety equipment with Zodiac life raft for 8 persons. 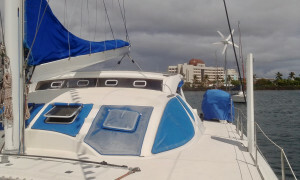 I would like to enquire about #CT52218 Catana 522 'Caligo' Version.